Video: What’s next for replacing lead pipes in Flint? 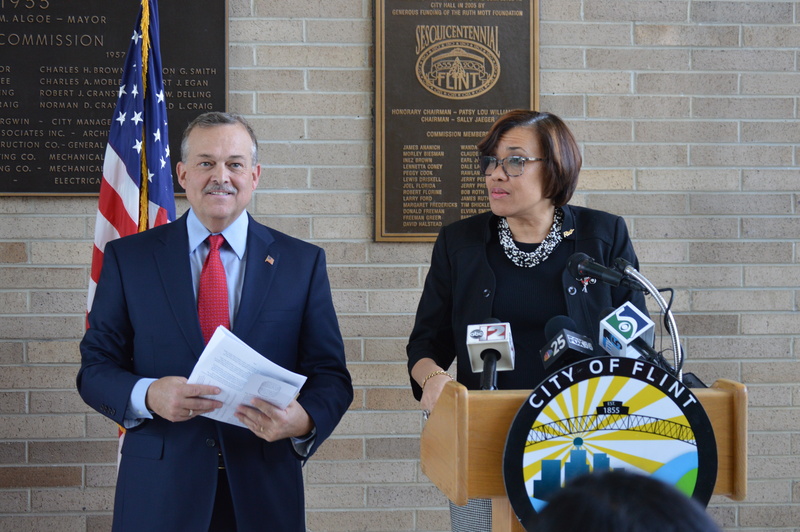 FLINT, MI — Flint officials announced during a March 29, 2017 press conference at city hall that they are ready to start the fourth phase of Mayor Karen Weaver’s program to replace pipes in Flint. Crews are set to start mid April with the infrastructure replacement after a group of AARP volunteers and CORE workers start to get permission to gain access to homes to replace lead lines. Officials plan to replace infrastructure at 6,000 homes this year under Weaver’s FAST Start program. So far, lead lines at 960 homes have been replaced. More information about the FAST Start program will be available on the initiative’s new social media accounts and the program’s official website here. There are plans to replace service lines at 6,000 Flint homes in 2017. The project is broken up into 10 zones of 600 homes each. Contractors are expected to replace lines at four homes per day. Residents must have an active Flint water account for service line replacement. The homeowner/property owner must give permission to replace the service line. Someone 18 years old or older must be at the home while service lines are being replaced. As part of the pipe replacement program, your water may be tested. Your water will be shut off for a period of four to 24 hours while the line is being replaced. Contractors will flush the water in your home for 15 minutes after the pipe has been replaced. All turf areas disturbed by the service line replacement will be seeded and mulched as soon as practicable.